TSN Toronto reporter Kristen Shilton checks in daily with news and notes on the Maple Leafs. The team held a 10 a.m. practice at MasterCard Centre on Monday. 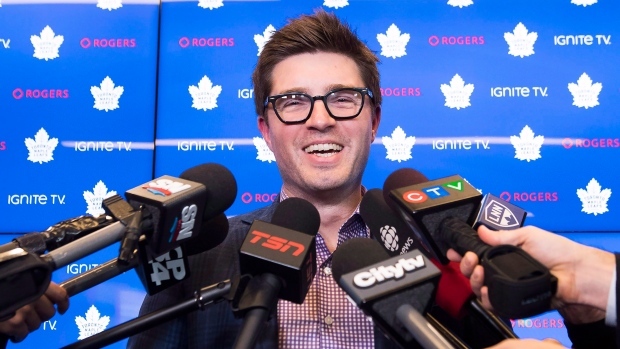 Kyle Dubas has heard the rumours that pending restricted free agents Auston Matthews and Mitch Marner are prime targets for an offer sheet down the road. But the Maple Leafs general manager insists he’s not losing any sleep over the idea. Dubas remains skeptical about all the offer sheet attention focused so specifically on Toronto, but he said Toronto is well-equipped to handle that situation if it were to materialize. As for the negotiations with Matthews and Marner, Dubas said the Leafs are working closely with their respective agents to finalize extensions sooner than later. While keeping Matthews and Marner in the fold is Toronto's main priority, the contract status of pending unrestricted free agent Jake Gardiner also needs Dubas’ attention. There’s been a lot for Dubas to like about the Leafs this season. Their breakouts haven’t been one of those things, though, to the point that if Toronto doesn’t improve in that category, Dubas will explore his options before the NHL’s Feb. 24 trade deadline. His team has been lacking consistency from its forwards lately, but head coach Mike Babcock likes what he’s seen from Matthews’ line with Andreas Johnsson and Kasperi Kapanen. Matthews’ progress has been especially encouraging, even if he’s gone three games without a goal. The centre is nearly two weeks removed from stepping back into Toronto’s lineup after rehabbing a shoulder injury, and Kapanen think his game has come all the way back around. Matthews said he is encouraged by his increased chances around the net, even if a goal hasn't dropped for him since Dec. 8 in Boston. There’s no denying the Leafs’ special teams are in a serious slump. The power play has one goal in the team’s last six games (1-for-22), while the penalty kill is 15-for-20 in the same stretch, giving up goals in four consecutive outings. Searching for answers, the Leafs are stuck between trying to adjust and wanting to stay true to their identity. The key, according to Matthews, is simplifying the Leafs’ approach with the extra man. Fixing the penalty kill isn’t as straightforward. A major part of the struggle, from the Leafs’ vantage point, has been opponents capitalizing on mistakes rather than fundamental problems with the team’s structure. With another game coming on Tuesday against New Jersey, the Leafs put extra emphasis on special teams before and during Monday’s practice.